Hi guys. I’m Karly. I blog over at Buns In My Oven about all kinds of ridiculous food. Lucky for me, I’m a total homebody, so the ridiculous food isn’t too much of a problem since I get to wear stretchy pants most of the time. I’ve been reading Nikki’s blog for, well, always? As long as I can remember? Sounds about right. When she asked me to fill in for her, I knew that I had to bring y’all something ridiculous and that’s why I’m here with my Sundae Cookie Bars. Don’t even roll your eyes. 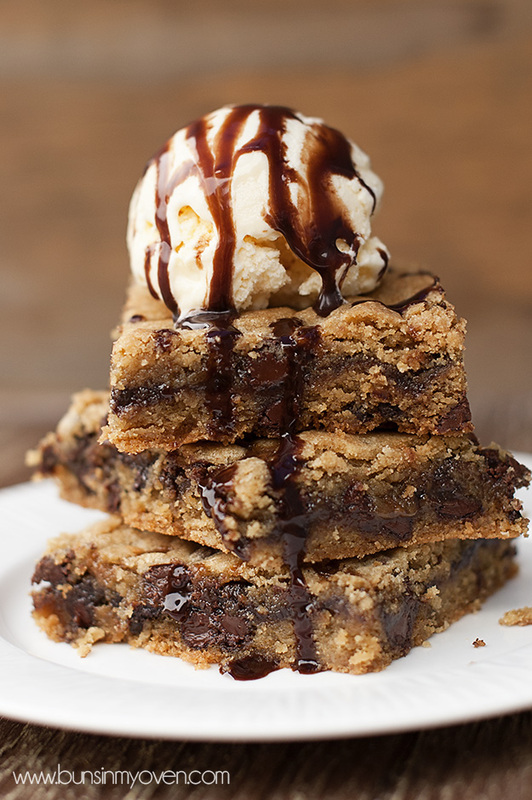 I know you’re thinking that there is nothing remotely ridiculous about a cookie bar topped with ice cream. You guys, I didn’t just top these bars with ice cream. I sandwiched hot fudge and caramel ice cream topping in between two layers of the dough before baking. See? Ridic. 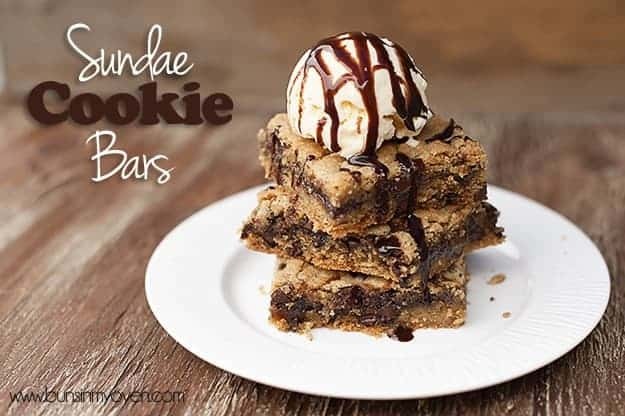 I am a self professed cookie bar addict, so trust me when I say that these rank right up there in the top 5 cookie bar desserts. I love ’em, but more importantly, you will too! Enjoy! In the bowl of a stand mixer, beat together the butter and sugars until light and creamy, about 5 minutes. Beat in the vanilla and eggs, one at a time, until thoroughly combined. In a small bowl, combine the flour, baking soda, and salt and stir. Gradually add the flour mixture to the butter mixture, beating well. Spread the hot fudge sauce in a thin, even layer over the cookie dough. 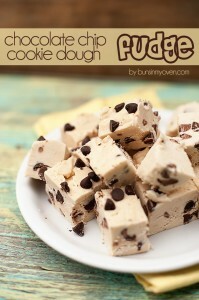 Use just enough to completely cover the dough. Spread the caramel sauce over the hot fudge in a thin layer, using just enough to completely cover. 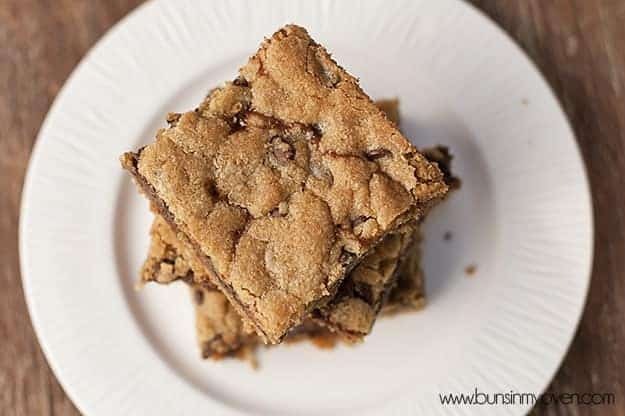 Take small chunks of the remaining cookie dough and flatten them into small pieces in your hand and place each piece in a single layer over the top of the caramel. You’ll need to press the pieces pretty thin in order to have enough to mostly cover the top. It’s okay if there are a small gaps, the cookies will spread as they bake. Bake for 25 – 30 minutes, checking them towards the end to keep from overbaking. 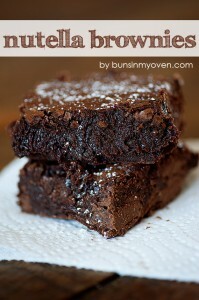 I like them a bit gooey and pull them out at 25 minutes. Thank you SO much, Karly, for being here today! 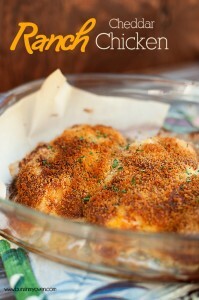 Isn’t her photography and recipes drool-worthy?! Karly, great to see you here! I knew before even reading Nikki's words that YOU were guest posting b/c I recognized your photography style, instantly! The bars look ridic good! Great guest post! I absolutely love Karly. And dude these bars are pure heavenly. Jason would go CRAZY over these!